Set in 16 acres of tranquil rolling countryside of south Vienne in the Poitou Charentes region of rural France, La Logerie, was a working farm until a four year conversion transformed this delightful cluster of stone buildings into three charming holiday gites with a spectacular heated pool plus a luxury hot tub spa. 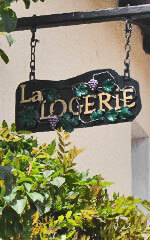 La Logerie's rental cottages can sleep a total of 23 people - perfect for large families. 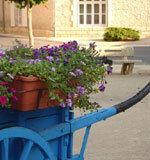 They offer easy access to Poitiers, Cognac and Limoges plus a host of local tourist and historic attractions. 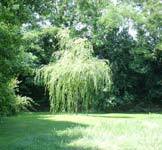 A small, tree lined stream meanders its way through the grounds, providing a cool and pleasant retreat from the summer sun while what was once a railway line adjacent to the property is now a picturesque byway, teaming with wild flowers and bird life. Buzzards circle lazily in the summer sky and towards late evening, barn owls announce their presence as they commence their hunting forays. 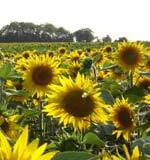 Fields of seasonal sunflowers, corn and wheat predominate in the countryside surrounding your holiday cottage creating a rural paradise of peace and tranquility. Take a dip in the impressive 12 by 6 metres swimming pool with stunning views over the surrounding countryside. Or for sun worshippers, simply lounge by the pool side or on the individual private terraces to each holiday cottage. To complete that perfect day, perhaps have an evening barbeque with a glass or two of the local wine. South Vienne in the Poitou Charentes, is ideal for walking and cycling or for water activities including canoeing and white water rafting on the River Vienne. The Atlantic coast is just a two hour drive away, while motor sport enthusiasts are just a ten minute drive from the Circuit du Val de Vienne - the second largest motor racing circuit in France. Just two kilometres from La Logerie's holiday cottages is the pretty village of Mauprevoir where there is a small well stocked supermarket, boulangerie, pharmacy, post office, garage and a restaurant and bar which has regular social and music nights featuring music for all tastes including jazz and modern.